Hyperhidrosis is a common illness that is characterized by excessive sweating. If not treated, this problem remains for the lifetime. 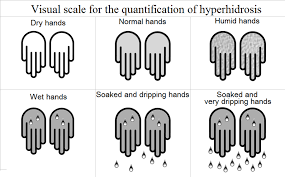 Though hyperhidrosis can occur as a result of certain endocrine, neurologic, infectious or other systemic illnesses, it usually occurs in healthy individuals. Excessive sweating may be triggered by emotions or heat in some individuals; however, in most of the people who suffer from the disorder, sweating occurs all the time during they are awake regardless of climate and mood. It is characterized by excessive sweating in the underarms and even in palms and soles. Excessive sweating is quite embarrassing, causes staining of clothes, and can lead to complications in personal and social life. People who suffer from severe symptoms may find difficulty holding a pen, gripping a steering wheel or even shaking hands. OTC antiperspirants are readily available and hence tried initially. If OTC antiperspirants are not successful in controlling the problem then antiperspirants of prescription strength are tried, which have aluminum chloride hexahydrate as ingredient. Iontophoresis is tried in which ionized tap water using direct electricity is passed into the skin. Oral medicines such as anticholinergics are used to decrease sweating. Botox-A may be used to reduced sweating in the underarms. Surgery may be used as a last resort to treatment in severe cases.